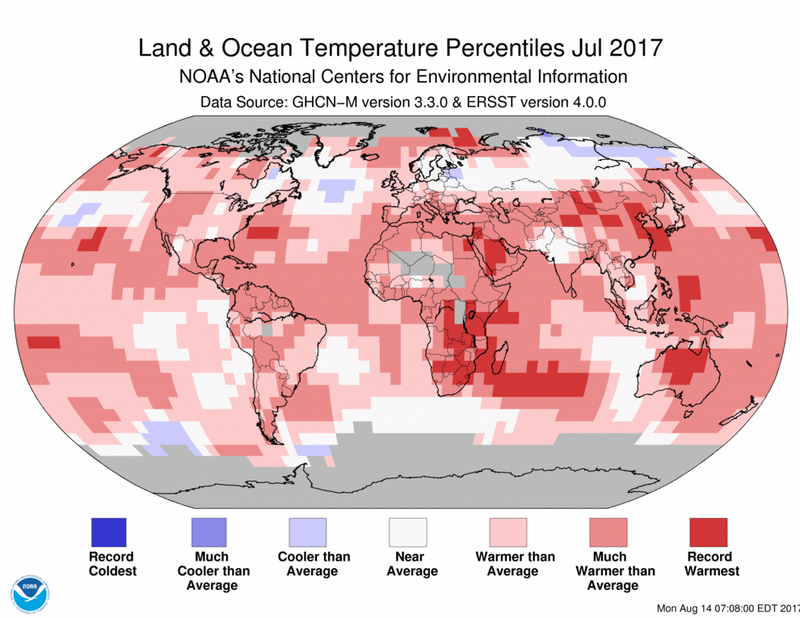 The globally averaged temperature over land and ocean surfaces for July 2017 was the second highest for the month of July in the NOAA global temperature dataset record, which dates back 138-years to 1880. The year-to-date global temperature was also second warmest on record. The July temperature across global land and ocean surfaces was 1.49°F above the 20th century average of 60.4°F, the second highest value for July in the 138-year period of record, behind 2016 by 0.09°F. July 2017 marks the 41st consecutive July and the 391st consecutive month with temperatures at least nominally above the 20th century average. The July globally averaged land surface temperature was 2.16°F above the 20th century average of 57.8°F. This value was the highest July land global temperature in the 1880–2017 record, surpassing the previous record set in 2016 by 0.13°F. This was the 25th consecutive July and the 281st consecutive month with land temperatures at least nominally above the 20th century average. The July globally averaged sea surface temperature was 1.24°F above the 20th century monthly average of 61.5°F. 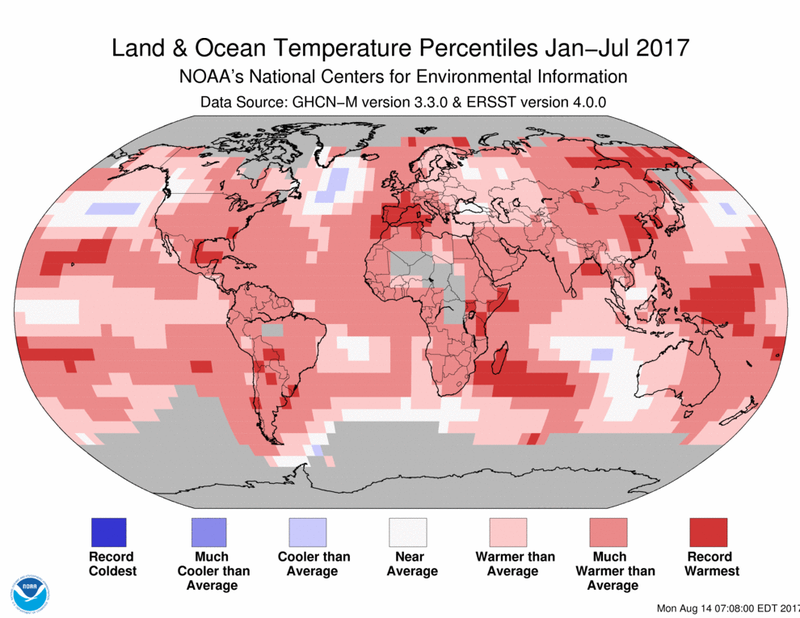 This was the third highest global ocean temperature for July in the record, behind 2016 and 2015. July 2017 marks the 41st consecutive July and the 490th consecutive month with ocean temperatures at least nominally above the 20th century average. The average Arctic sea ice extent for July was 610,000 square miles (16.1 percent) below the 1981–2010 average. This was the fifth smallest July sea ice extent since records began in 1979, according to an analysis by the National Snow and Ice Data Center based on data from NOAA and NASA. The Antarctic sea ice extent for July was 290,000 square miles (4.5 percent) below the 1981–2010 average. This was the smallest July Antarctic sea ice extent since records began in 1979. 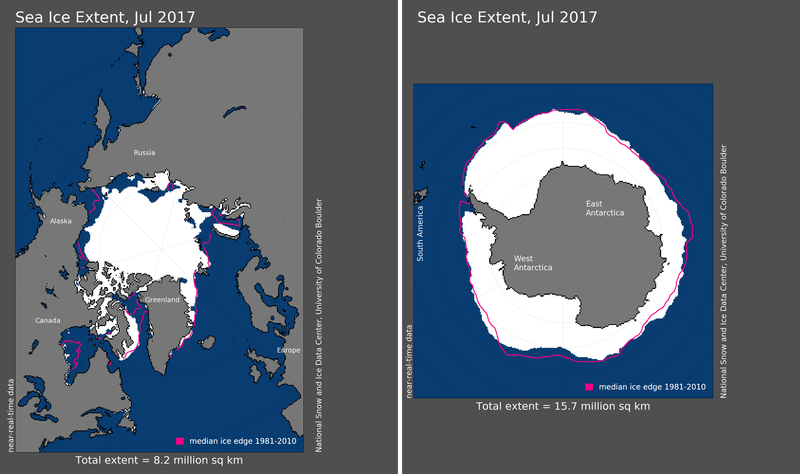 The July 2017 Antarctic sea ice extent was about 40,000 square miles smaller than the previous record set in 1986. The year-to-date temperature across global land and ocean surfaces was 1.62°F above the 20th century average of 56.9°F. This was the second highest value for January–July in the 1880–2017 record, behind the record year of 2016 by 0.25°F. The year-to-date globally averaged land surface temperature was 2.61°F above the 20th century average of 46.8°F. This was also the second highest for January–July in the 138-year record, behind 2016 by 0.45°F. The year-to-date globally averaged sea surface temperature was 1.24°F above the 20th century average of 61.0°F. This was the second hiest for January–July in the record, behind 2016 by 0.20°F. 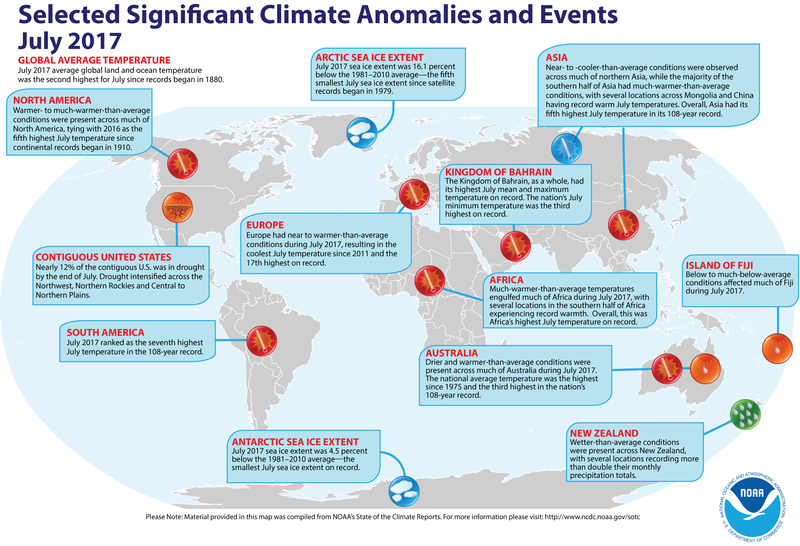 For a more complete summary of climate conditions and events, see our July 2017 Global Climate Report. The February temperature averaged across the contiguous United States was 41.2°F—7.3°F above the 20th century average.